This delicious recipe has been generously shared by one of our Lovefoodies supporters, Eduardo Orozco. 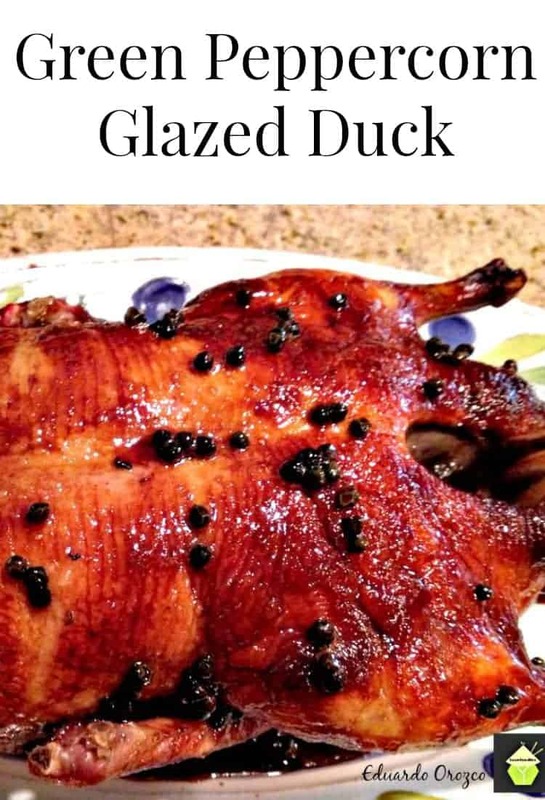 It’s cerainly a most delicious recipe, and when you see the results with the nice crispy skin on the duck, combined with the wonderful flavours Eduardo has used in his glaze, it is sure to tickle the taste buds of every diner! 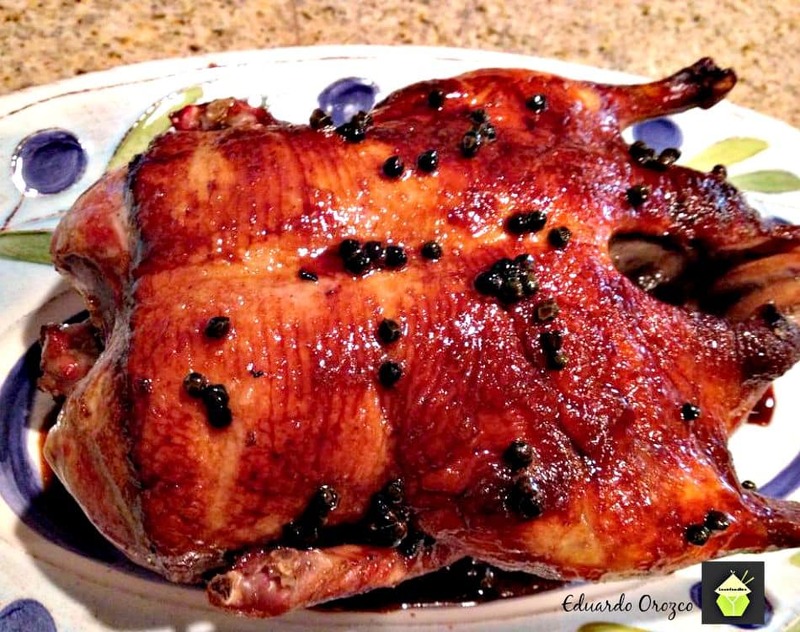 So let’s see how Eduardo makes this wonderful Green Peppercorn Glazed Duck. Cook Time: 1 hr 30 minutes. 1. Preheat oven to 500 F and arrange the oven rack in the centre of the oven. 2. Remove the innards of the duck and reserve them for another use or discard. Remove any loose pockets of fat surrounding the cavity. Season the inside of the duck with salt. Take a fork and prick holes through the skin, all over. Try not to prick so deep it penetrates the meat. Just the skin is ideal. Also pay particular attention to the extra fatty areas, like the thighs, and prick extra holes. This will help the fat release during cooking and give for a crispier skin. 3. In a pot large enough to hold the duck, combine the water, 3/4 cup of the soy sauce and 1/3 cup of honey. Bring to a simmer over low heat. Add in the brine from the green peppercorns, lower the heat and submerge the duck, breast side down into the pot. Let it simmer 30 seconds, basting the top and sides with liquid. Remove the duck and arrange it breast side down, in a roasting pan with a rack that elevates it off the bottom of the pan. (Ideally the duck should sit overnight to allow flavors to meld and the skin to dry out.). 4. Put the roasting pan into the oven and turn the temperature down to 400°F. Allow 15 minutes roasting time for each pound of duck. Cook for 20 minutes. Remove pan from oven, then flip the duck. Using a turkey baster remove the excess fat from the bottom of the pan and transfer it to a heatproof liquid measuring cup. Return the duck to the oven and cook for another 45 minutes to 1 hour, depending on the size of your duck. 5. Meanwhile, in a medium pot, combine the champagne vinegar with the remaining 1/4 cup soy sauce, 1/4 cup honey, Marsala and the reserved green peppercorns. Bring the ingredients to a boil over high heat. Lower the heat and simmer gently, allowing the glaze to reduce and the flavors to blend. Taste for seasoning. Allow to cook until all flavors meld together. 6. Remove the duck from the oven and baste it with the drippings in the bottom of the pan. The duck should be about 150°F when a thermometer is inserted into the thigh meat. 7. Transfer to a platter and pour half the glaze over the breast and thigh meat. Reserve the remaining glaze for plating. Allow the bird to ” rest” for about 15 minutes. Carve the duck and arrange on a serving plater. Season the flesh with salt, if desired, and top with remaining glaze. Preheat oven to 500 F and arrange the oven rack in the centre of the oven. Remove the innards of the duck and reserve them for another use or discard. Remove any loose pockets of fat surrounding the cavity. Season the inside of the duck with salt. Take a fork and prick holes through the skin, all over. Try not to prick so deep it penetrates the meat. Just the skin is ideal. Also pay particular attention to the extra fatty areas, like the thighs, and prick extra holes. This will help the fat release during cooking and give for a crispier skin. In a pot large enough to hold the duck, combine the water, 3/4 cup of the soy sauce and 1/3 cup of honey. Bring to a simmer over low heat. Add in the brine from the green peppercorns, lower the heat and submerge the duck, breast side down into the pot. Let it simmer 30 seconds, basting the top and sides with liquid. Remove the duck and arrange it breast side down, in a roasting pan with a rack that elevates it off the bottom of the pan. (Ideally the duck should sit overnight to allow flavors to meld and the skin to dry out.). Put the roasting pan into the oven and turn the temperature down to 400°F. Allow 15 minutes roasting time for each pound of duck. Cook for 20 minutes. Remove pan from oven, then flip the duck. Using a turkey baster remove the excess fat from the bottom of the pan and transfer it to a heatproof liquid measuring cup. Return the duck to the oven and cook for another 45 minutes to 1 hour, depending on the size of your duck. Meanwhile, in a medium pot, combine the champagne vinegar with the remaining 1/4 cup soy sauce, 1/4 cup honey, Marsala and the reserved green peppercorns. Bring the ingredients to a boil over high heat. Lower the heat and simmer gently, allowing the glaze to reduce and the flavors to blend. Taste for seasoning. Allow to cook until all flavors meld together. Remove the duck from the oven and baste it with the drippings in the bottom of the pan. The duck should be about 150°F when a thermometer is inserted into the thigh meat. Transfer to a platter and pour half the glaze over the breast and thigh meat. Reserve the remaining glaze for plating. Allow the bird to " rest" for about 15 minutes. 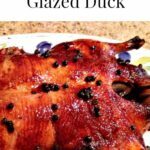 Carve the duck and arrange on a serving plater. Season the flesh with salt, if desired, and top with remaining glaze.